The cycling jersey. It tends to be one of those pieces of clothing that if you don’t get it, you don’t get it. But for the uninitiated, the cycling jersey can seem like one giant fraternity tattoo announcing to the world that you are officially part of the cycling club. This can be good or bad but from where we sit, the cycling jersey is a necessity if you’re going to put in some big miles on two wheels. You’re a keen cyclist and you not only want to get the best out your cycling health-wise, you may also want to wear the best gear to help you achieve this. Cycling jerseys are a good place to start if you are wondering why you’d benefit from the purchase of a good one. Chances are you started out with a trusty favorite cotton T-shirt you’ve cherished from your first concert, it’s loved and it’s your best. But does it really serve a practical purpose when you’ve decided that you want to take cycling a bit more seriously? We've updated this list with three new products including a really nice addition to our top picks list. But if you're committed to going about on two wheels you are going to find something here that you're going to like. Your favorite tee may be your first choice, but there are ways to keep it special for longer by reserving it for less active and strenuous pastimes. 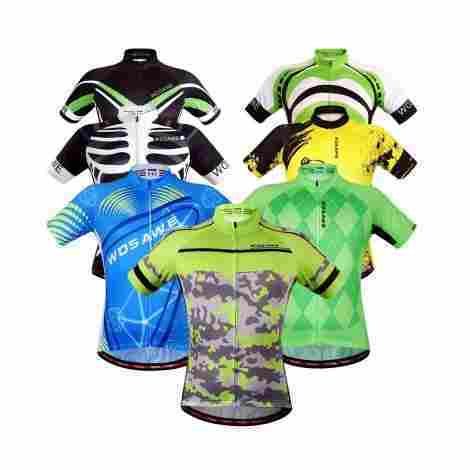 Consider a cycling jersey that will help you to prolong the life of that special tee, and get yourself a top that will serve a few good purposes that you will probably get a better benefit from. Cotton, as a material doesn’t ‘perform’ the same way as a specifically designed cycle jersey, it soaks up moisture and sweat yes; but it fast becomes heavy to wear and doesn’t dry very quickly. It probably won’t have the bonus of hidden pockets for all of your small valuables, and there’s a good chance it won’t be UV treated or flex with you as you ride. This guide and review of the best ten cycling jerseys will provide you with plenty of ammo even for the biggest nonbelievers out there, and aims to give you some food for thought when you’re choosing the new set of cycling gear. The full ten best are listed and reviewed to give you more information on each product and will take some work off your load in your quest for an ideal cycling jersey. Sponeed offer this one hundred percent polyester to boost comfort and easy care, the quick dry material benefits from being comfortable next to the skin and won’t stick to damp areas. It is available in four different color combinations; red and white, green and white, blue multi and white, all are stylishly designed with complimenting contrasting patterns. The short sleeved cycling jersey is comfortably cut to cover the base of the back when in a riding position – and is higher at the front to reduce bulk. The cycling jersey has a full-length zipper that makes it more practical to adjust the opening for fast opening and closing allowing ventilation and allows versatile air flow in different conditions and changing temperatures. 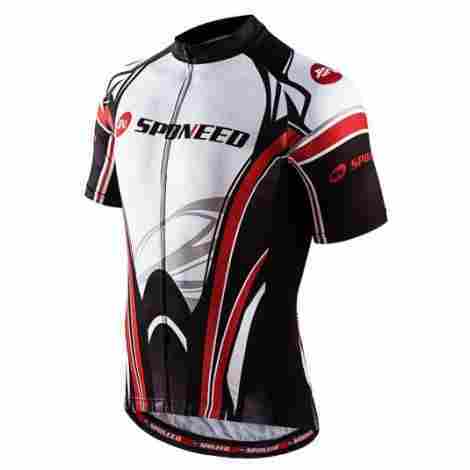 The Sponeed jersey is conveniently available in a good range of sizes ranging from small to extra large; the useful home washing option improves the appeal and the product is boosted by a non-fade finish that will endure many washes and rides. When considering the balance between cost and value; this Sponeed cycling jersey offers user-friendly fabrics and a comfortable, non-bulky shape. 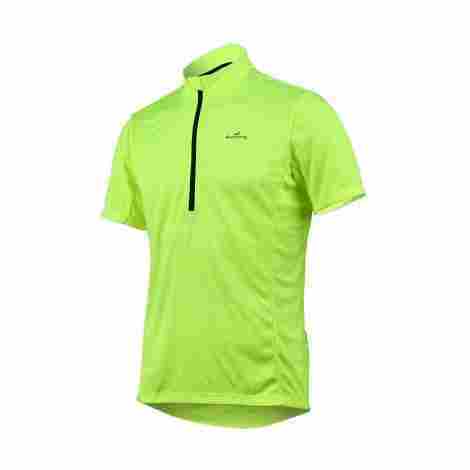 The features including the easy gliding full zipper ensure this top is great value for money. Want to look cool riding a bike and not like a garish tie-dyed billboard then the Louis Garneau Lemmon 2 is the jersey for you. The jersey is stretchy and light but fits snugly without being too tight. It moves water off the skin has pockets and a sturdy front zipper. In this day and age as more and more bikes hit the road it seems more and more drivers are finding it harder and harder to see them. It is an uneasy alliance between two wheelers and four wheelers and that’s why if you’re riding you need to pay as much attention being safe as you do to making good time. The reflective bands on this jersey help a lot. The mesh is set at the upper back and sides and lets air get into the jersey while you’re doing your two wheeled thing. It makes for a more comfortable ride and keeps the jersey flexible and allows air to circulate through the jersey so it helps keep you dry. This is a nice price for a really nice piece of clothing. Sure it’s mean for biking and it’s fairly clear it’s a biking jersey, but it’s also a solid color which makes it possible that you could use it when you’re doing something besides biking, and that’s a huge plus because many of our choices scream BIKE JERSEY so loudly you really can’t do much else with them. 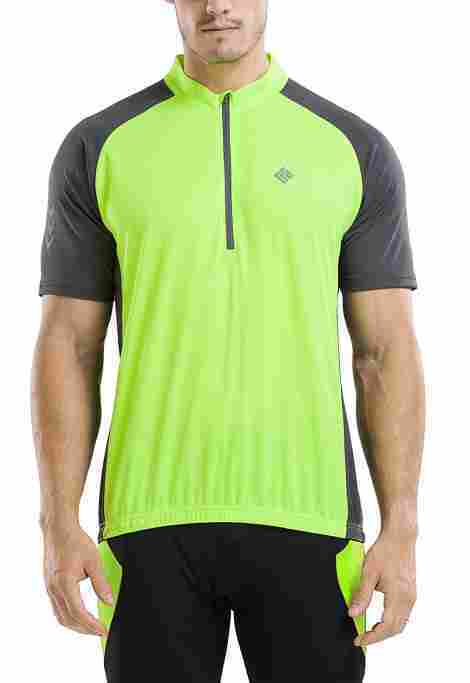 This cycling jersey is available in four colors; green with black panels, plain green, blue and black. The short sleeve design is lightweight and is designed higher at the front for no bulk, and lower at the rear for an all over more comfortable riding fit. It has a half-length; twelve-inch zipper that benefits not only from a cover flap on the raised collar to help prevent chaffing on the neck, but being SBS Vislon quality. The 4ucyclng jersey is produced using one hundred percent quality premium polyester; giving it higher comfort levels in terms of keeping cool, being both hard wearing and high wicking for practical wear. The rear of the jersey has three convenient and useful pockets that use elastic to keep personal items safe when out riding, there is an additional zippered smaller pocket for valuable items to be stored safely and within reach. The short sleeved jersey offers a range of features including a moisture-wicking ribbon on the collar to increase comfort, combined with the soft easy-care fabric it is well balanced when considering both cost and value. Lixada offers this cycling set in a variety of color designs, the short sleeved jersey top has a sculptured cut so it fits comfortably when in the riding position. It is manufactured with quality polyester material that benefits from moisture wicking to improve comfort when riding, to aid the ventilation, the jersey is fitted with a full-length zipper for easy access and the neck has a soft ribbed finish for reduced rubbing and chaffing. The shorts complete the full outfit and boast being made with an anti-bacteria padded 3D cushion for improved comfort, and also include the addition of silicone hem grippers to help prevent the legs riding up during use. The jersey has a practical set of three pockets that enable secure storage of smaller personal valuables, and the quick-drying nonslip breathable design increases the full versatility of both the jersey and the shorts. When taking into consideration the value represented with this two-piece set, adding the combined features of comfort, wicking, and quick drying capabilities, gives overall confidence that the cost is reflected well. This stylish and well fitting cycling jersey is available in a substantial range of vibrant and striking colors. The polyester fabric encourages wicking and prevents moisture build-up for comfort even when riding in heat, and also benefits from integral underarm mesh panels for increased comfort. To complement this there are also direct vent panels for increased ventilation and the full zipper allows for even more as and when it is needed. The WOSAWE cycling jersey benefits from three handy pockets for safe holding of small items that are within easy reach for convenience. The zipper has a smooth gliding action and is protected within a neat dip to keep it out of direct sunlight and improves usability. The hem of the jersey has a logo silicone strip on the interior to help decrease the possibility of it riding up when being used, and the short set boasts a padded 4D gel pad for greater comfort even on the longest rides. The price differences on the whole reflect the single jersey purchase or the set, the features including the stylish fit and design, and the functional ventilation all balance well and give excellent value for money. 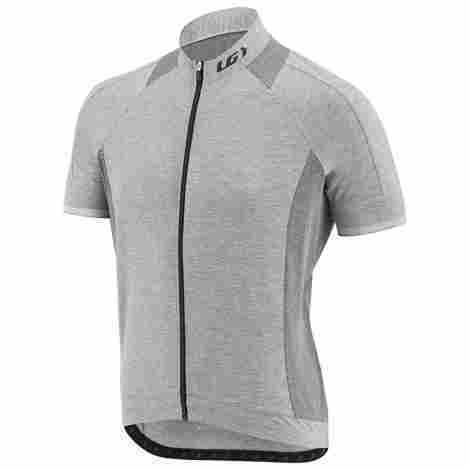 Pearl iZUMi has produced the Quest short sleeved cycling jersey in a vast range of colors, the standard tee design is comfort fit and has a half-length quality zipper for adjusting the air flow and ventilation with ease when riding. The one hundred percent polyester fabric is manufactured to be comfortable to wear, offers a lightweight tough jersey that optimizes breathability and moisture transfer. The hem of this cycling jersey is elasticized to minimize riding up and twisting when riding, and the practical placement of three decent pockets on the rear improve its functionality for holding personal items close and within easy reach. The designs use sublimated graphics on the jersey, and this improves their longevity when worn over time. This feature is utilized to full effect on the quality Select Transfer fabric that improves active moisture management. The overall balance between cost and value is equally reflected and well balanced with this quality jersey, the advanced wicking system and comfortable no-fuss design enables confidence in the top and is great value for money. We like beer! 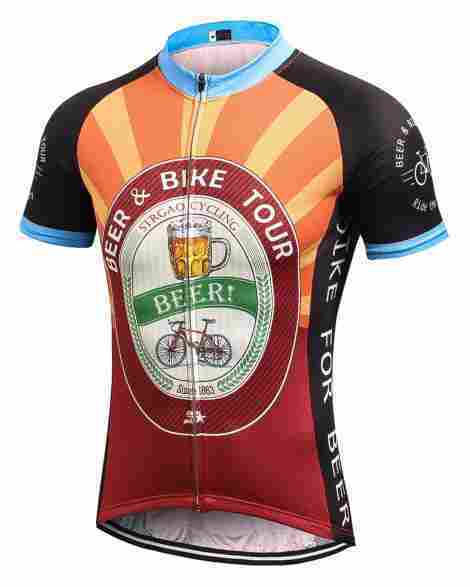 And we particularly like biking jerseys that display cool beer brands. But honestly, this really isn’t about beer it’s about these cool looking Strgao jersey’s that seem to have the aesthetic of skateboards imprinted on their cycling jerseys. If you want to stand out, this is the way to go. Skull head logo? Check! Beer Logo? Check! There’s plenty of opportunities to trick out your Strgao cycling jersey and most of them are fun and really pretty cool. It is hard to look cool in cycling gear but if you want to give it a go these Strgao jerseys might just allow you to pull it off. Exactly what you need in a cycling jersey. The mesh allows air to circulate within the jersey and wicks water away from your skin so it lets you prolong that ride just a bit longer even in hot, miserable weather. A little pricier than some of the other jerseys on our list but we just like the look of the Strgao jerseys. They’re a nice take on the normal really loud biking jerseys that we see all the time but with a cool twist that makes them not only easy to see but possibly even hip. The Spotti long sleeved cycling journey is offered in a choice of eight striking colors, and the fabric has vibrant dye sublimation to prevent color loss and keeps it looking brighter for longer. It benefits from an added sun protection treatment that is a great addition for peace of mind when riding on long hot days and journeys. It has a handy half-length twelve-inch zipper for quick and easy access to adjust ventilation. The fabric is boosted by being manufactured with advanced breathability which proffers to increase both the qualities of high-value wicking, quick drying capabilities and is lightweight for a comfortable wear on any cycle ride. For increased visibility the jersey has the benefit of a printed logo on both the front and the rear; that is reflective to give an added safety element when riding in changing light conditions. And as a bonus – it is also easy to wash and care that can be done at home. The reasonably priced Spotti long sleeved cycling jersey has plenty of features that enable both cost and value to be equally reflected and balanced. The quality protective fabric and the handy pockets are combined with a comfortable fit and ensure a good purchase. 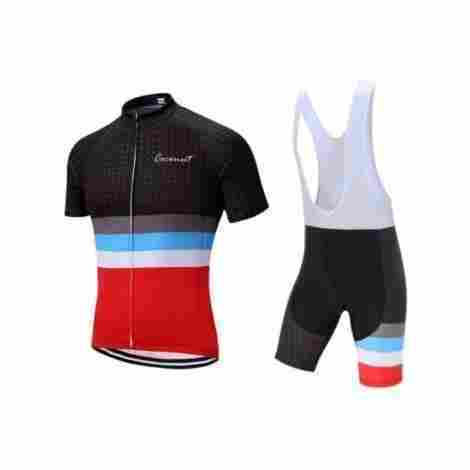 This cycling set comprises both a jersey and shorts; and is a practical purchase for any riding purpose. They are produced using one hundred percent polyester that boasts being an advanced breathable nature, providing both high wicking capabilities and quick drying elements. This also gives a boost of increasing ventilation and offers adjustable air flow control with a full-length easy gliding zipper and ribbed neck. The zipper offers a self-locking function so it won’t ride up or down on its own, and the side benefits from mesh side panels for improved comfort. The jersey has three good sized pockets on the rear with an elasticized closure for safe storing personal items when riding. The fabric is comfortable next to the skin and the shorts have an added padding to protect the hip whilst riding, and the 3D style provided extra comfort when riding. In addition; the jersey has a silicone grip to prevent it riding up and becoming uncomfortable. The Coconut Ropamo cycling set has two quality items that are designed for longevity and durability. The shorts are complimented with the vest so there are no tight waists to restrict movement. Overall, this set is great value for money. A nice jersey and just a bit looser than some of the other jerseys on our list. This looks and fits more like a T-shirt than a tight cycling jersey and we like that. Plus, the whole thing is pretty much a giant reflective jersey and that’s a good thing for anyone who has to spend their cycling time worried about sharing the road. Almost every jersey has a thingamabob that keeps the jersey from riding up while you’re doing your thing and this one we particularly like. It’s elastic with rubber waist grippers and it accomplishes the whole keep the jersey around your waist thing quite well. The thing is it does it while maintaining the shirt’s loose look and feel. We actually like the half zippers more than full zippers because they don’t’ snag as much as full zippers and once a full zipper snags or breaks you are out, of, luck. So these half zippers just mean your shirt is going to be useful for that much longer. The thing is most of the bad ratings we get on these jerseys have to do with full-length zippers. This jersey comes at a great price so buy a couple. Also since this doesn’t tend to follow the ‘loud enough to be a cycling jersey’ ethos this shirt can actually serve as double duty on any number of things you want to do outside that requires sweating. All in all a great addition to our list. Cycling jerseys are designed differently to normal tee shirts for a few reasons, a standard day to day cotton tee will be a basic T shape (as the name suggests) and won’t have any specific cuts to allow free movement and comfort. The front of the cycling jersey is usually cut higher than the back, this creates less bulk when you’re in the riding position and is also lower at the back and this keeps the base of your back covered as you ride. The fitting is also important because each specific type of cycling jersey usually belongs within a specific group. For instance, if you’re a speed machine and enjoy racing then a race cut will benefit you; they are designed to be sleek and close fitting to get the most aerodynamic fit as possible with little or no spare fabric to slow you down. For a more relaxed and comfortable ride and fit, looser cut cycling jerseys are often named within the ranges of sport or casual designs. 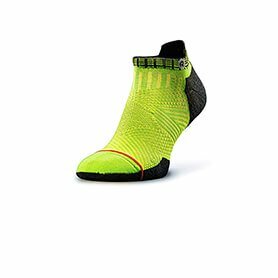 These are made with practicality and comfort in mind and are not restricting in any way which allows them to be worn for longer, more leisurely cycle rides. Invariably, unless you plan to keep your cycling to night time; you will at some point be riding in the sun. As lovely as it is, we are all aware of the dangers of unprotected exposure and should plan to avoid this as much as we can. Some types of cycling jersey fabric is treated with a level of SPF to help reduce the risk of burning; specific products should tell you in their own product specification what rating the SPF is, if any and allow you to be proactive accordingly. As a general cautionary lead though, you should always wear sun lotion as well as relying on your top because the sun is crafty and can still burn the skin through fabrics. Like standard tee’s, cycling jerseys come with a variety of sleeve length, obviously the shorter sleeved type of jersey is more practical for warmer months but will not offer the same level of cover in the sun, cooler options would be to choose a long sleeved jersey that is specifically for summer use. Longer sleeved cycling jerseys are also available in thicker and warmer fabrics that are designed as such to keep you warmer in the winter or cooler months. A useful point here is the cycling jersey is ideal for layering, so if you start out early in the day, or in the cooler climates and you find yourself becoming overheated – you can peel away layers to make yourself more comfortable. Although cotton is a wonderful fabric, it is common knowledge and a well-established belief that a cotton tee is less practical for use in cycling clothing. Improving technological advances mean there are new products being designed all the time, and as a reflection of technology – the man-made synthetics commonly available are very practical. The fabric draws sweat and moisture away from the skin and encourages it to evaporate through the cycling jersey, the addition of mesh inserts also allows a better flow of air. The two features combined allow body temperature to remain steady and will keep you cooler and more comfortable for longer. Merino wool is also a good cycling jersey fabric, it serves as a wicking layer and will also keep your body warm even when wet, invaluable when you get caught in that random shower from know where, or you are particularly sweaty on a hot day. Another benefit with wool jerseys, as is with all wool clothing – it retains less odor than man-made material and can be worn more than a few times before you need to wash it. A note here on odors and synthetics – although the fabrics are treated to reduce odors, the more the jersey is washed; the less the coating can repel so if you wash it frequently, the odor build up becomes apparent in a shorter period of time. Another plus for specifically designed cycling jerseys is the addition of pockets, not something you tend to find easily on a regular tee. The practicality of having neat integral pockets is immense; especially if you have to keep small personal valuables with you on your ride, for instance, keys, medication, cell phone etc. Most cycling jerseys will have a strategically placed pocket at the rear, these are neatly incorporated into the overall design and are either zipper or Velcro closures for convenience. Pockets are also used on the chest of the jersey because this allows really quick access and doesn’t necessarily mean getting off your bike to reach the contents. Contemporarily; cycling jerseys usually have a zipper, this may be a full or partial closure. Each type is useful because not only do they allow quicker access and removal; but they allow you to adjust the airflow around your body as the temperature affects your core heat temperature – the warmer you get, the more you can pull the zipper down, and likewise if you find yourself cooling – you can simply pull it back up. There are options regarding the fabric surrounding the zippers, you can find smaller zipper sizes that are ‘hidden’ with a clever way of sewing them in, so there is less chance of the zipper getting hot from direct sun and burning your chest. Some cycling jerseys have zipper garages that allow the top to be comfortably tucked away to reduce chafing and rubbing next to exposed skin. 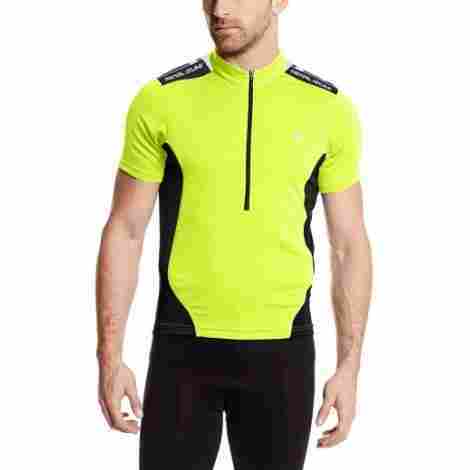 There are also zipper less cycling jerseys for super quick removal and putting on, but these are not as versatile because you cannot alter the air flow by opening them up. Button top types are available too; and whilst these are becoming more accessible, they may prove tricky to undo when you want to cool down quickly or warm up quickly in varying temperatures. This basic guide and review of the best ten cycling jerseys have the intention of taking some of the guesswork out of your buying and shopping experiences. The market on the whole, seems to be bursting with innovative technological advances that are making all cycling gear more user-friendly. The useful practicalities of cycling gear and their overall benefits are being recognized within the industry, and new ideas are enabling a better range of kit. With the innovations and ideas, however; there becomes more and more to choose between and this may be a little overwhelming especially if you are buying cycling clothing for the first time. The guide has been provided to give you your own starting point, from which you will be able to gauge your own needs and requirements, which should then stand you in good stead to be able to peruse a little easier. All that said, may this full guide and review enable you to have happy shopping, safe and happy cycling. Q: My cycling vest is primarily mesh, do I still need sun lotion? A. It is always advisable to use sun lotion under any cycling jersey especially if you are likely to be exposed to the sun for any length of time. Modern synthetic fabrics are sometimes treated with SPF, but you should always err on the side of caution and apply sun lotion as well. Q: Are cycling jerseys suitable to layer? A: Yes; they are, and it is considered to be a good idea to layer especially if you are going to experience temperature fluctuations that will make you either too hot or too cold. Q: Does the fit of a cycling jersey make any difference? A. It can yes, depending on what sort of cyclist you are or intend to be. If you are looking forward to cycle racing; then you would be better to purchase a race jersey because they are designed to be sleek, close fitting and reduce drag that may slow you down. For leisurely cycling you could be more comfortable in either a sport fit or active fit jersey, these are looser fitting and are comfortable enough to wear for longer periods of riding. Q: Are synthetic cycling jerseys better than cotton ones? A: Again this can depend on how you ride if you are considering serious riding or doing longer journeys; then yes, a synthetic jersey is the way to go. Cotton is always thought of as a cooler go to when it comes to sports and warmer climates, and whilst this is marginally true for day to day wear; if you’re cycling you need a moisture repelling fabric that helps to wick away sweat and forces it to evaporate on the outside of the top. Cotton soaks up moisture, becomes heavy and takes longer to dry; running the risk of making you cold and uncomfortable even on the warmest of days. Q: Is a long sleeved jersey advisable as opposed to a short sleeved version? 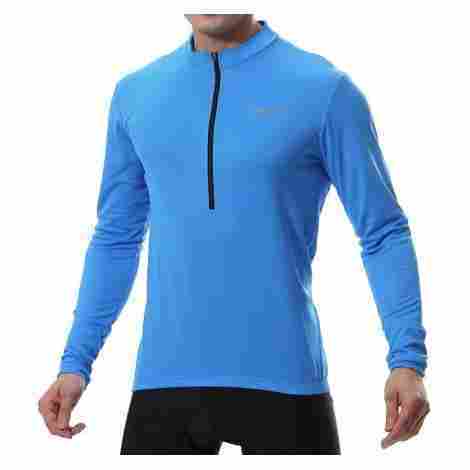 A: This question has a few variables, for instance, if you want more protection from the sun then a light long sleeved top will suit you better; likewise if you are cycling in cooler or cold climates a thicker, more substantial long sleeved type may benefit you as part of a layered system. Short sleeves are just as practical for temperature control, and it really comes down to personal preference which type you decide to purchase. At the end of the day – if you’re comfortable and properly protected, either will suffice. Q: Will merino wool jerseys make me too hot? A: Merino wool has a unique wicking property that draws moisture and sweat away from your body, and is relatively quick to dry. They are slightly heavier than synthetic jerseys and you should take this into account; especially if you are traveling long distances or going on a cycling trip. Q: Are hidden zippers as easy to use as regular zippers? A: They are specifically designed to be as smooth gliding as a regular zipper, and the fact that they are hidden does not detract from this useful feature. The ease of use is very practical because the zipper is out of direct sunlight and it is simple to pull down when you are riding and need a bit more ventilation and airflow to help keep you cool.